If you intend to buy a rangefinder, there is the dilemma of financial engineering. Do you purchase a more expensive laser rangefinder, or take possession of a low-cost model which works on ultrasound. Some theoretical background and practical information are essential and help you to make the right choice. High accuracy and precision of measurement – rangefinder can measure distances even with millimeter precision and achieve this result with very high repeatability. Millimeter of error is very difficult to measure using traditional tape or other gauges, especially when measuring longer distances. Tachymeter – rangefinder measure the distance without the need for special mirrors or reflective material. The electromagnetic wave emitted by the instrument is reflected from the object which is in the focus back to the instrument. The distance is determined on the analysis of the returning wave. Long range – there are manual rangefinders on the market, which measure kilometer distance, but with low accuracy. Most instruments allow construction class set length 250 -meter sections. Calculations on the screen – some rangefinders can calculate various values on the basis of the measured length. 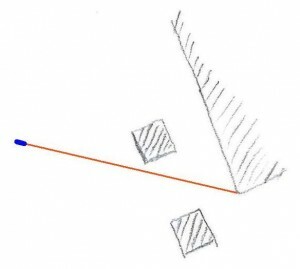 Simple instruments calculate surface and volume, more advanced rangefinders can determine inaccessible segment lengths using the Pythagorean theorem, and the top-shelf tools show even the inclination of objects. Miniature size – manual rangefinders are small, lightweight, resistant to adverse weather conditions, and run on 2-3 batteries, which allow several thousand measurements. based on direct measurement of the time it takes the impulse to travel a double line between rangefinder and an object – in rangefinder’s pulse. Ultrasonic rangefinders operate on a similar principle as laser rangefinders. Here, however, the transmitting unit consists of a speaker and a microphone. 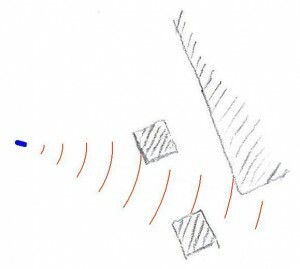 The speaker does not emit electromagnetic waves, but a sound wave. The electronic module measures the time that elapses from the sending of the ultrasonic signal to receive the returning echoes through the receiver. Advantages and disadvantages of laser rangefinders and ultrasonic rangefinders result directly of the type of waves they use to measure distances. Even if the rate determining distance is closely dependent on the propagation speed of the waves – electromagnetic speed of about 300 000 km/s (speed of light) and ultrasound at about 343 m/s (speed of sound in air). Both types of waves bring with them basic physical phenomena – reflection, refraction and absorption. In fact the different behavior of the electromagnetic wave and ultrasonic rangefinders both types have their advantages and disadvantages. What are the advantages of laser rangefinders? What are the disadvantages of laser rangefinders? What are the advantages of ultrasonic rangefinders? What are the disadvantages of ultrasonic rangefinders? Looking at the above points, go ahead, it is clear that the ultrasonic rangefinders lose virtually every aspect of the competition with laser rangefinders. Finally, an important note – some ultrasonic rangefinders on the market are equipped with a laser spot that acts as an indicator. Please be careful, because an ultrasonic rangefinder still measures based on ultrasound. In such models the laser is just for aiming the target.